Are you so busy that you just can’t keep up? Is your home in chaos? Do you want a calmer and more organized life? 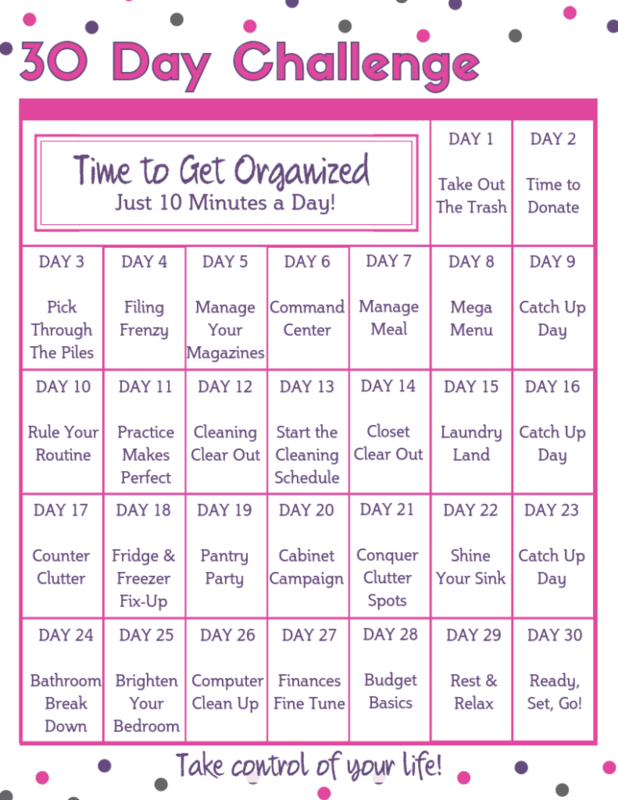 This 30 Day “Time to Get Organized” Challenge is designed to help you get organized and stay organized! Fall Behind… But Don’t Fail! We all lead busy lives and have to juggle a lot of different things. It’s easy to get overwhelmed and lose control of everything we have to. When we are busy it’s so easy for our home life to take a backseat and we end up even more stressed out. Having chaos at home, does not help when you need to focus of your work life. This 30 Day Challenge is specifically designed to help you take control. “Time to Get Organized” is a simple system of daily tasks. And don’t worry, they are all quick and easy! Most of these tasks will take 10 minutes or less! Are you willing to spend 10 minutes a day for the next 30 days, so you can live a more organized and relaxed life? Sounds a pretty good deal to me! You might be nodding along and saying that you definitely need help to get organized, but you also might be making excuses too. “I have the big project at work, I can’t focus on anything else right now”. There will never be a “perfect” time to start this challenge. You will always find excuses for why you can’t start today. But guess what… they are excuses! The sooner you get started, the sooner you can take back control of your LIFE! Use this box below to sign up today! Once you’ve confirmed your email address (you’ll get an email asking you to confirm… so make sure you click the link in the email), you will then receive your first daily task! Every day you will receive a new email with your latest daily task. It’s OK if you get behind by a day or two. Sometimes things happen and you just can’t get to do your daily task. That’s OK. The important thing is that you stick with it! The only way that you fail, is when you stop trying! So let’s do this! Let’s get more organized together! 7 Cleaning Tips from People With Tidy Homes!